One affordable, flexible device that can serve as either a global controller or a field DDC will go a long way toward better HVAC system designs. The first test of good design is obviousness. The obvious design for a digitally-controlled HVAC system would have the flow of data through the logic network match air flow through the equipment. But, working with the building blocks of global controllers and direct digital controllers (DDCs), HVAC system designers often opt for more confusing designs. Economic and physical constraints force the control network designer/installers to compromise. New systems integrators and technicians that arrive on the scene have a difficult time interpreting the flow of data in the controls architecture. Detailed documentation helps, but is not a full solution to confusing initial designs. 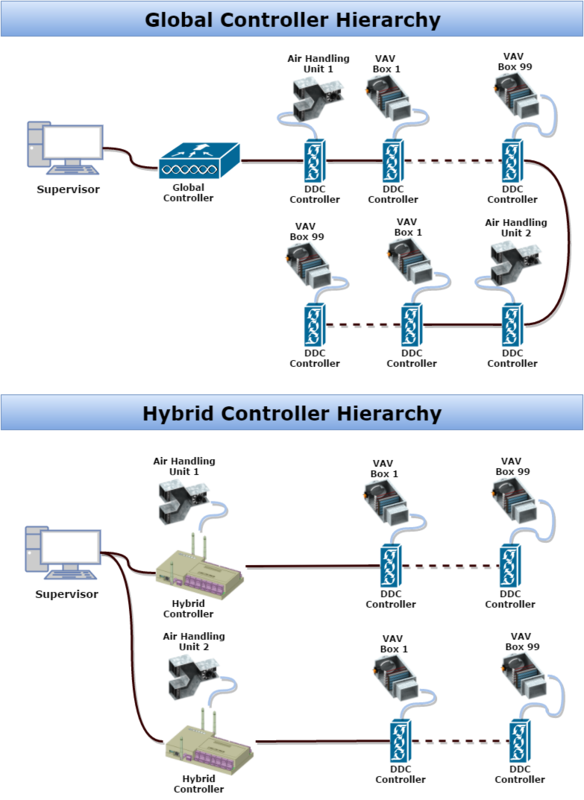 Hybrid Controllers that can act as either Global Controllers or Field-level DDCs are poised to change this situation. They will enable data flow that more closely mirrors the flow of air through a building. 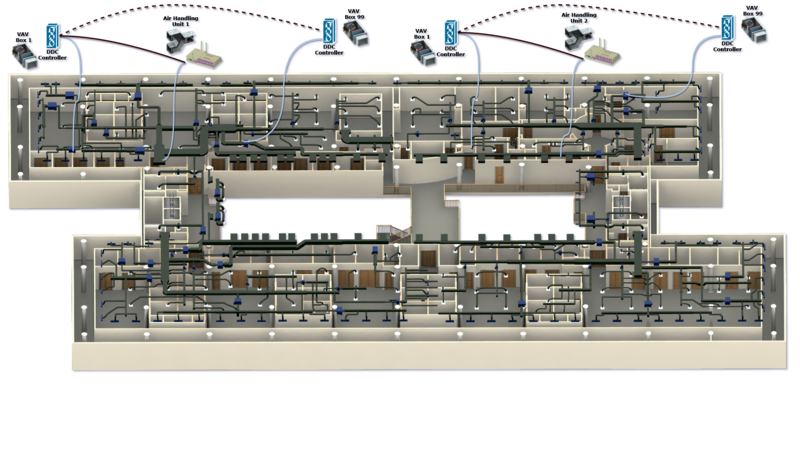 HVAC design practices will get back to the classic principles of easy discoverability and simple feedback loops in this next phase of Building Automation System (BAS) platforms. The impact is not limited to air control; Hybrid controllers will make the logic designs for controlling chilled water, hot water, demand response, integration of renewables and other building infrastructure networks more obvious, easier to maintain and more solid to build upon for years to come. Digital building controls gained popularity over the last three decades, coinciding with the PC client/server era in information technology. Thus, it makes sense that the hardware for a controls network for air handling in a medium-to-large-size, multi-story building starts with a PC running the Building Management System—ie, the central console or supervisor. First-level clients for this server are a series of Global Controllers (GCs) for each floor. GCs are typically assigned to distinct Air Handler Units (AHUs). Global controllers serve the next level clients, a series of regular DDC controllers for distinct variable air volume (VAV) units. Global Controllers act as gateways passing data and reading inputs according to some agreed upon protocol. There was a time when common practice was to source all the GCs and DDCs from a single equipment manufacturer. Then, control network protocols were proprietary and building owner customers were locked in. Since the Open Building Automation System (BAS) trend took hold, data communications between an AHU Global Controller and client VAV DDCs are served via industry-standard protocols, like BACnet, Modbus and and LON. High-end GC’s have the connectivity, processing power, graphics capabilities and storage resources to host applications that aggregate data across systems; visualize building operations with high-end graphics; capture temperatures and energy data as time-series trends; generate alerts and alarms; analyze trend data to extract various types of insight, and perform other services. Typical of PC Client/Server architectures, there is a directory system interface available to represent data flow through the trunks and branches of the logical network of GCs and DDCs. Controls designers use the same software folders that anyone who has used a Microsoft Windows operating system understands to structure this controls network directory. Good design practice would have the flow of data through a control network closely align to the flow of air through the hierarchy of AHU and VAV equipment within the spaces under control. A big factor incentivizing control system designers to stray from this ideal is the widening price differential between a Global Controller and a field DDC. A GC with sufficient feature/function for an HVAC controls network costs in the range of $3-5K. Low-end field DDCs cost just a few hundred dollars each. It is not unusual to see control networks designed such that one Global Controller is responsible for 3 to 5 AHUs with 100 or more VAVs attached to each. With a “folder structure” representing the logical structure of the system, a GC has limited ability to do good trending and roll up of data for such a complex hierarchical control network. A reset strategy, for example, is a 2-step process. The Global Controller has to make a list of connected VAVs, do an average, then reset. There is little correlation between the flow of air and logical flow. Anyone other than the original controls designer would have to have good documentation to understand everything going on. New Hybrid edge controllers like the BASSG EAC are available at a price point which makes it possible to have a Hybrid Controller on every AHU providing a feature set far beyond that of field DDC controllers at a price point far lower than conventional GC’s. This one-to-one correlation makes the logical flow of the network architecture obvious. Newcomers won’t need to guess how data is being served throughout the system. When a reset is necessary for a particular AHU, only the VAVs that are connected to that piece of equipment will need to be imported. Control network designers can practice intuitive good design. The onsite PC supervisor is becoming a thing of the past. 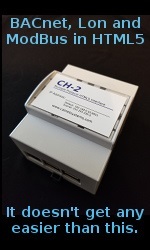 Now, AHU controllers are more likely communicating to a cloud-hosted BMS via secured Ethernet connections. Hybrid Controllers that are pre-configured to support Project Haystack meta-tagging and data transport methodology go even further to promote self-describing systems and best-practice design. Self-describing Haystack data models can include reference tags to reflect relationships between systems and components, making it easy to represent dependencies of equipment. For example, you can reflect how VAV’s relate to each other and to a particular air handler system right in the model. The Haystack Community has been working together toward pragmatic naming conventions and taxonomies. A controls network designer that uses the Haystack methodology for data modeling would do well to follow the same taxonomy of references when the hardware is being installed in the physical world. The goal would be simple closed-feedback loops where physical flow of air always matches logical flow of data. For example, when an AHU pushes air to a VAV, the VAV signals back to the AHU its status. However, there will be exceptions when an impenetrable wall or other obstruction will make the optimal design impossible. However, if data-to-air flow matching could be achieved in an HVAC control system even 80% of the time, it would be an obvious and well-designed system that would be universally understood by most HVAC technicians for years to come. Network resiliency can also be ensured in a Hybrid Controller network. Remember that the path to confusing, data-soup designs started with the perceived high cost of Global Controllers versus DDCs. While more expensive than a low-end field controller, Hybrid Controllers are still a fraction of the cost of a Global Controller. The practice of keeping spare devices on hand for the possibility of a failure will become an affordable option, ensuring the high-availability of data and resiliency of the network. In fact, at today’s prices you could have about four Hybrid spares for the cost of one high-end Global Controller.